Every other week Scott Jon Siegel contributes Off the Grid, a column about card games, board games, and everything else non-digital. Risk: Black Ops is one of the most beautiful board games you'll never play. 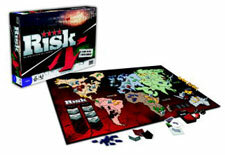 In anticipation of the newly updated release of Risk, Hasbro produced only 1,000 copies of this special edition game, distributing them to bloggers, journos, and gaming hobby sites for perusal and easy publicity. The response was unanimously positive. The updates to the rules -- handled by Risk 2010 designer Rob Daviau -- lower the game's initial barrier to entry, and make it possible to play through in under two hours (which is significant for Risk). Most media attention, however, was lavished on the slick, modern redesign, devised under the command of art director Lindsay Braun and visual designer Jason Taylor. Risk has always wanted to be taken seriously, but Black Ops is the first version of the game to look deadly serious. A matte black finish on the box is accented by imagery of barbed wire, dog tags, and the faintest hint of blood spatter, all rendered in a subtle gray. "History is written by the victors," the box declares in a modest sans-serif font. The game board itself is designed to look like something out of our modern war-rooms, with a visual style not unlike Introversion's apocalyptic strategy game Defcon. This is not the Risk you remember. And sadly, it won't be the Risk future generations remember, either. When Hasbro unveils the new version of Risk this fall, the commercial release will eschew the subdued aesthetic of Black Ops for the standard bright colors and decided optimism of the classic conquest title. Make no mistake: the new Risk will still be new in many ways. Rob Daviau's revised rules will be in full effect, and the board is still receiving a visual upgrade from Lindsay Braun and Jason Taylor. Unfortunately, gone will be the fresh-faced look of Black Ops, leaving us to wonder what a new approach to visual design could have done for the languishing board game industry. According to a representative from Hasbro's PR firm, the decision to introduce the slick visual look of Black Ops, and then revert to old faithful was entirely intentional: "The Black Ops version was designed to set the stage for the skirmish before the big battle" she said. "The design suggested a time of stealthy maneuvers - the Black Ops - and a preview of things to come. "The bolder and flashier colors of the Risk game board are symbolic of larger battles and struggles between opponents. It is meant to be bold, proud, defiant and inspiring." Meanwhile, a cursory look at eBay reveals the continued appeal of Black Ops: copies of the limited edition game have reached $300 each in bids. Here's hoping Hasbro takes the hint and reconsiders the road less traveled. Scott Jon Siegel is a fledgling game designer, a professional blogger, and a mediocre cook. His words and games can be found at numberless, and he's holding out for Hasbro to release Monopoly: Black Ops. He thinks that would be sweet.